Blue Sun is a charming three-bedroom conch cottage that has been completely renovated by a professional interior designer to showcase the bright, airy and colorful Caribbean vibe of Key West. It's located in the Casa Marina district, a coveted quiet neighborhood where you can pack a picnic basket and walk to the beach. The decor follows the time the house was built, circa 1950. Guests are treated to a mid 20th-century modern conch look. The open floor plan includes a lovely living room with French doors that open to the large pool and back patio surrounded by lush tropical landscaping. The kitchen has a modern take on an old-fashioned soda fountain bar. Each of the three bedrooms evokes a Key West mood. Your hosts have completed the island look by adding meticulously selected local art for the walls and yes, the floors, too. The front and the back of this seasonal rental has beautifully manicured trees and flowers that offer a sensual and private feel to the home. Your hosts would love for you to enjoy swimming in the large heated pool and lounging or barbecuing on the patio. This is the type of home you would expect the characters from the TV series Mad Men to be renting had they chosen to spend their vacations in Key West. This beautiful home is only available for home stays of 28 days or more. Some pets are welcome. Parking: No parking spots reserved, on street parking only. Location: 6.5 Blocks to Duval Street. 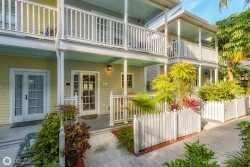 Walking distance to the beach, restaurants, art galleries and more.